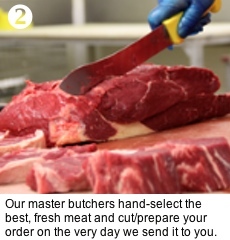 On the very day we dispatch your order, our master butchers individually hand-select, cut and prepare all the fresh meat for you. 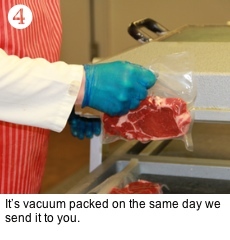 Next, to maintain its freshness, it’s vacuum-packed and placed in temperature controlled packing boxes, so the meat stays in perfect condition. 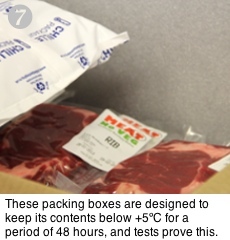 Lab tests have been carried out on our packaging, so you can be sure that the meat remains at the right temperature for at least 48 hours. 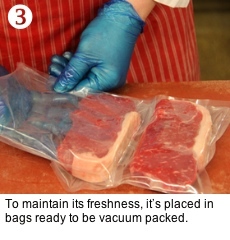 Vacuum packing is a great way to keep meat fresh, and saves space in your fridge too. 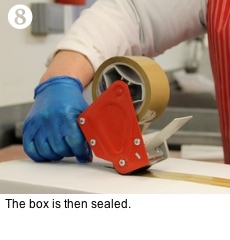 It works by reducing the air around the meat, so it can’t react with it. 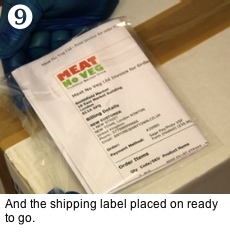 When you first open the pack the meat may have a slightly unusual smell and colour, but there is nothing to worry about. Unwrap it and let it stand for about half an hour. The changes are caused by the lack of oxygen around the meat, so once it’s open to the air, the smell will disappear and the colour will bloom. 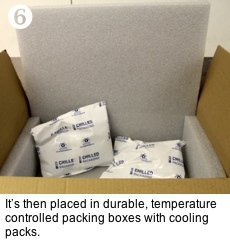 We normally send deliveries within 48 hours of ordering, Tuesday to Friday. We can deliver on Saturdays. However, there will be a surcharge for this facility. 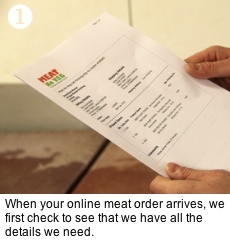 You can select a delivery date when ordering. We aim for all deliveries to be made before 1pm. We use national couriers to deliver your order, on a day convenient to you. We will provide you with confirmation of your required delivery day. There MAY be a charge for a faileddelivery. You can place your order any time day or night, but if you have a specific event you are buying for, it is worth considering our delivery schedules below. Sunday before 8pm will be delivered Tuesday or as requested. Monday before 8pm will be delivered Wednesday or as requested. Tuesday before 8pm will be delivered Thursday or as requested. Wednesday before 8pm will be delivered Friday or as requested. Thursday before 8pm will be delivered Tuesday or as requested. Saturday before 8pm will be delivered Tuesday or as requested. NOTE: Saturday deliveries are possible at an additional cost. We deliver anywhere in mainland UK. How can I help make the delivery go smoothly? 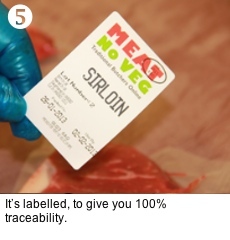 It is important that upon ordering you provide us with as much information as possible, i.e. leave with neighbour at 33, top floor flat, put behind gate etc. It is preferable for your order to be accepted personally by you - perhaps a delivery at work is practical? There MAY be a charge for a failed delivery. We now offer FREE standard Delivery on all orders of £50.00 or more. Should you have any enquiries about delivery please use the email link below or use the contact us facility on the website. We will track your delivery for you.